After attending school at the Seven Systems Academy of Terraforming Arts in Crash Course and saving the school from the evil principal, Elara spends a restful (if somewhat boring) summer back on her family's farm on their far flung planet. She works with her brother on a small terraforming project, but is glad to be back at school. When the space ship delivers her, however, she isn't on Paragon. Instead, she's on a spaceship with robotic teachers, and everyone is in the same uniform. Over the summer, there were communications that the SST was closed, but Elara didn't get them. Her friends Knot, Beezle and Sabik, as well as her new roommate, mean girl Suue, try to get her up to speed on the changes that were made. Because of the evil principal, everyone was concerned about keeping the students safe, which is why the moving location of schoolships and the constant monitoring are put in place. Know and Clara are in isolation for a while because the life support systems might not have been ready to support their life forms, but it still seems a bit odd to Elara. Even odder is the fact that Groob appears to her and indicates that there is danger, and one of the new overlords of the school, the Watchman, has a device similar to Groob's, and Elara is sure that he is a time traveler. Things get stranger and stranger until Elara realizes that the student body are all being hypnotized. Outer space is dangerous enough without being worried that your school, which demands you trust it completely, is evil and does not really have your best interest at heart! Strengths: Mind controlling adults and the tweens who save their peers from them are always popular, and the idea of going to school in space is appealing. Elara has a good friend group, she excels at her classwork, and she finally gets to know and understand Suue a bit more. This is definitely great science fiction for elementary students, who don't need some of the scary aliens that sci fi for older readers has. Weaknesses: I would have liked to see more terraforming projects, and I missed being on Paragon, and I don't understand the character of Clara at all. She doesn't communicate at all; I'm expecting she will bust out in a later volume! What I really think: The first book has not been as popular as I would have liked, so we'll see how it does this year. 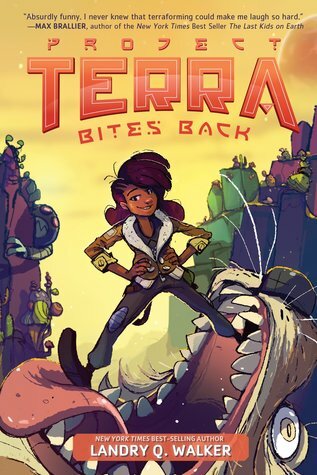 I liked the scientific base of this, as well as the adventure, but I wonder if the cartoon covers skew a little young for readers who like science fiction.